This is the easiest seat to install ever!! We loved this seat so much, we purchased one for each vehicle. Wish I had this years ago with my first kid! I got this car seat a few months ago when my son turned 1 and I am amazed at the quality of it! It was very easy to install and the straps are so easy to tighten and loosen, unlike others I've had. He also sits very comfortably in the seat, the padding around him is very comfortable and not too much. This car seat is so much better than the ones I've been using for the last 5 years, they've really come a long way in how they are made. We need 2 car seats and purchased just one to make sure the seat was what we wanted. After using for a couple of weeks I'll be ordering a second. Easy to tighten and use. Fits well in a smaller space in the backseat. We love the ease of this car seat and the price so much, this is the 2nd one weâ€™ve purchased from here. this car seat is simple to transfer between cars, easy to cinch tight, and feels solid and secure. This is our third Chicco Nextfit! This one was purchased for my mother in lawâ€™s car. We tried a different brand seat and quickly realized how badly we missed the features of the Chicco. We have had a Chicco Nextfit ZIP for over a year now and really enjoyed it. When it was time to buy an extra seat for my husbandâ€™s car it was a no brainer to go with another Chicco Nextfit. We bought a chicco convertible seat for our van and loved it so much we bought another for our truck. We absolutely love how easy and fast it is to install / uninstall. I highly recommend this seat. Our little guy is so comfortable in it too. ProsQuick, easy and accurate install every time. Best UsesSince they are heavy car seats they are best for people who don't have to switch the seat from car to car. This is an amazing convertible car seat! I moved my baby from an infant car seat to this convertible car seat and was surprised by how safe and snug he is in it. The seat and headrest padding makes it very comfortable. Since we spend a lot of time in our vehicle, having a cozy and safe seat is of utmost importance. The reclining position is easy to adjust and the bubble level indicators provide safety assurance. The only issue we've had is my son easily pulling off the harness pads. Since it's a comfort feature and my son pulls and tears apart most things, I don't consider this to be a major issue. Also, it would be nice for the cup holder to be a little sturdier or more tightly connected to the seat. Again, a minor issue. The safety, ease of use, attractive design, and comfort level make it an excellent convertible car seat which I highly recommend. No need to look any further, this is the BEST! This car seat is amazing!! As a first time parent, I was nervous with the installation but it was extremely easy. Even my mom feels comfortable installing and uninstalling this car seat in her car. The fabric is machine washable which has been a lifesaver since accidents do happen. Our son is still rear facing but this car seat will grow with him. It is safe, practical, easy to clean, and stress-free to install. It checks every box that a parent is looking for in a car seat. We have been extremely happy with the NextFit Sport car seat and would recommend it to anyone in the market for a car seat. Our family would highly recommend this NextFit Sport car seat. With our first child we have loved the Chicco car seats and knew we wanted to get another for our second. We decided on the Nextfit Sport and are extremely happy again with our purchase. The LATCH technology makes installing this car seat a breeze. The bubble indicators are great since they make sure the car seat is always in the proper angle. The headrest is easy to adjust. Our son is tall and is extremely comfortable in this seat even though he is still rear facing. You will be happy if you decide to purchase this car seat. It is a great. The NextFit Sport is a great buy. The Latch system makes us feel so secure in that the seat is doubly hooked in to the car. The adjustability makes it easy to ensure that our baby is comfortable, and of course the washability is a huge plus given the messes that can happen in the car! Overall, we are very happy with the seat and would definitely recommend it to any family! Chicco has provided this product to me in exchange for my honest opinion. We bought this for our son a couple years ago. It's been a very solid and easy to use car seat. Installing it was made easy with the clips, and it is also easy to install using the seat belt, if needed. We were in an accident earlier this week, and my son (now age 4) was in this seat. The seat was installed properly, and he was buckled in correctly. This car seat kept him safe during the accident (which totaled the vehicle), and the only injury he sustained was from something that flew up in my car during the accident. After the accident, we could see that the car seat was under a lot of stress from the accident, as observed by fissures in the material of the seat. I am so, so, so glad we had this seat and that it kept my son safe like it was designed to. 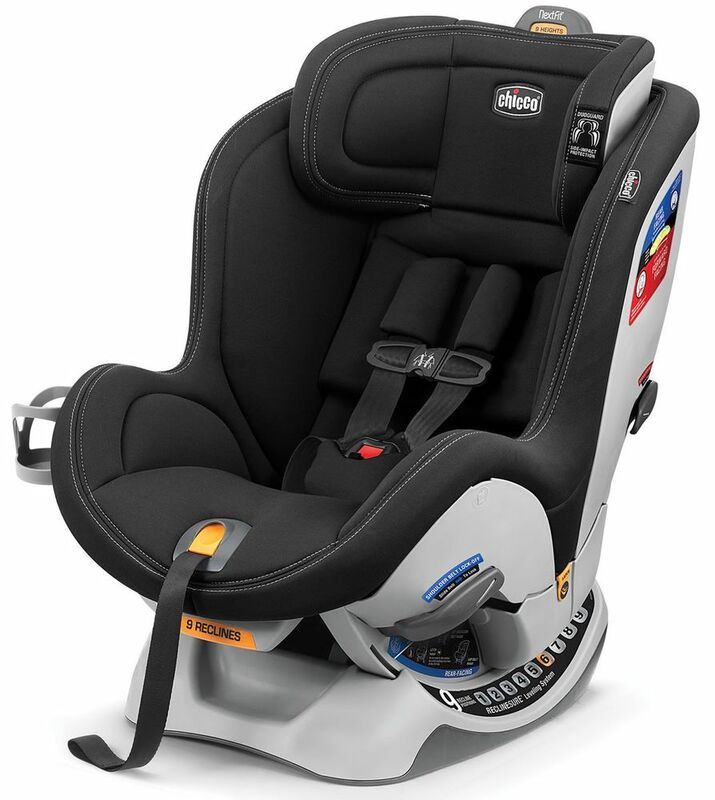 I 100% would buy another one of these seats from Chico after seeing first hand how well it protected my child. The NextFit Sport Convertible Car Seat has been great for our family. The ease with which we were able to install it into our car was a surprise and a definite benefit. The multiple positions offered to ensure that our baby is comfortable is an added bonus. This is a great buy and we would definitely recommend it. This car seat is the absolute best! The easy installation is like no other, with simple tools to ensure that the seat is tightened and locked in place appropriately, and more easily than any other seat. We love that this seat transitions from rear facing to forward facing, so it will accommodate our little one comfortably for a long time. The nine positions of the headrest will give us lots of options to keep baby safe and comfortable as she grows, and the fabric is really nice and durable (and machine washable!). We're so happy this seat will transition with us from rear facing to forward facing - all the way to 65 pounds. This seat is definitely a winner! Chico provided this product to me in exchange for my honest opinion. My little guy is still rear facing, and this seat was very easy to install. I'm happy he'll be able to transition from rear facing to forward facing and continue using this seat. The adjustable straps is a nice feature too! Chicco provided this product to me in exchange for my honest opinion. A Breeze to Install, plus Great Features! This car seat is like no other when it comes to installing! The tightening system is so quick and easy with the SuperCinch feature that you barely have to flex a muscle. I have literally had to crawl on top of other car seats in order to tighten them down, but experienced complete ease with this NextFit car seat installation. It is also very easy to uninstall with the push of a button! Another top feature, in my opinion, is the belt slide path which allows you to quickly move the belt's position from backward to forward facing and vice versa, without having to look up a u-tube video to figure it out! The seat itself is very soft and comfortable with secure padding that fits over the top of the shoulder straps and the lower buckle, and they stay in place without needing to adjust them every time you put your child in the seat. I highly recommend this convertible car seat, it is hands down the best option in my experience. Our growing little one needed to move out of his infant car seat sooner than expected (getting very tall! ), and this seat is the perfect next step for him. It's really easy to install (don't have to wrestle with it) and I like that its easy to see whether you've done it correctly. Fantastic Car Seat- We Love It! I couldn't be happier about this car seat. We love our NextFit Sport Convertible Car Seat. As a first time mom transitioning my son into a convertible car seat, I was nervous about selecting the right seat. I choose this seat because of it's #1 rating for years with Consumer Reports and it was the #1 most recommended car seat by my mom friends. It was important to me that it came so highly recommended and rated. The LATCH installation was so straightforward and simple. I felt confident that the seat was installed correctly and the transition was easy for my son. Overall fantastic car seat- we love it!